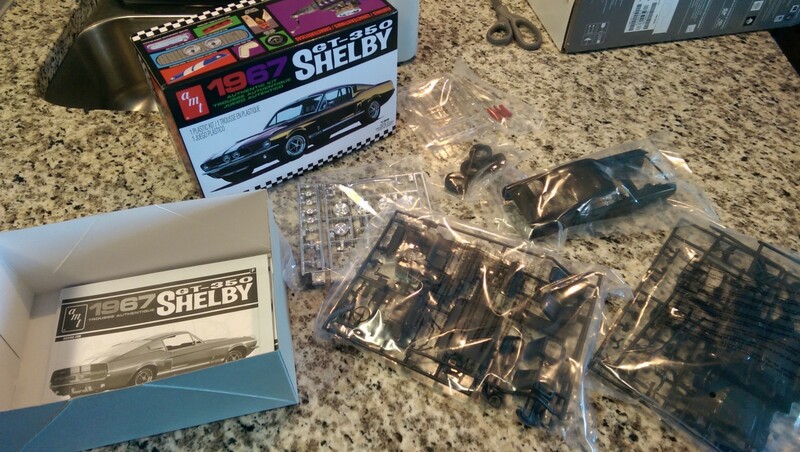 Many of those that have worked on model cars/trains/planes, have been doing it for years; most, starting at a young age. Any model search on the Real Prop Forum will yield an impressive display from experienced modelers. Unfortunately, I’ve yet to gain that experience. 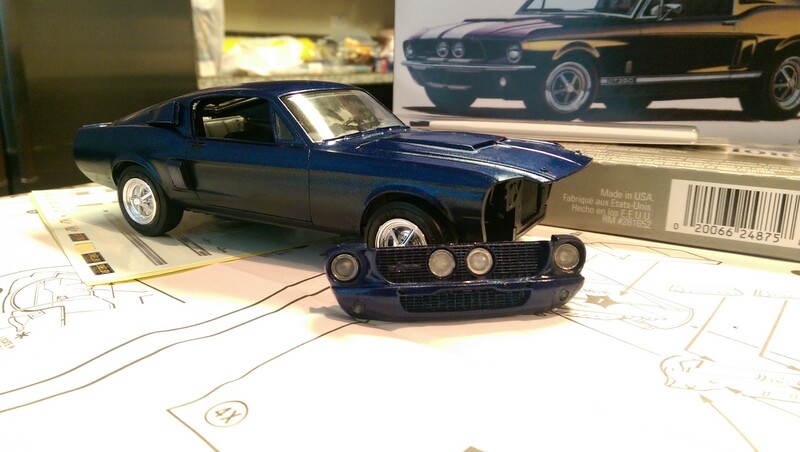 This my first attempt at putting together any model — it turned into an absolute disaster but, was a lot of fun! 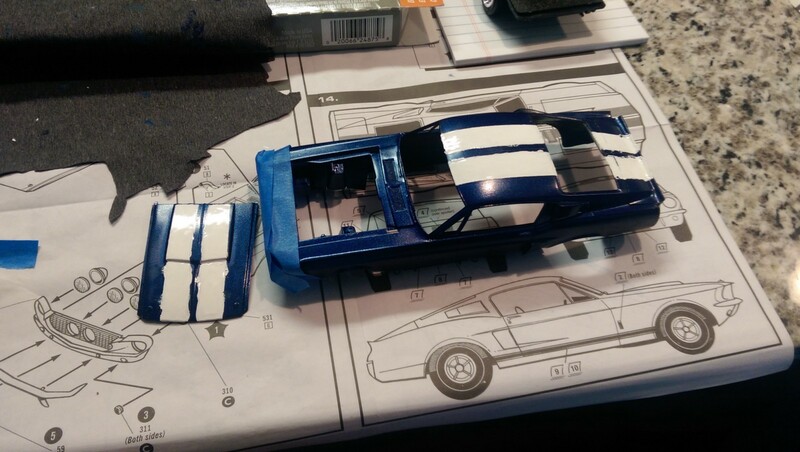 I decided to go with a Metallic Blue with white racing stripes. I was aways a fan of this combination on the 90s Dodge Viper and figured it would work well here. 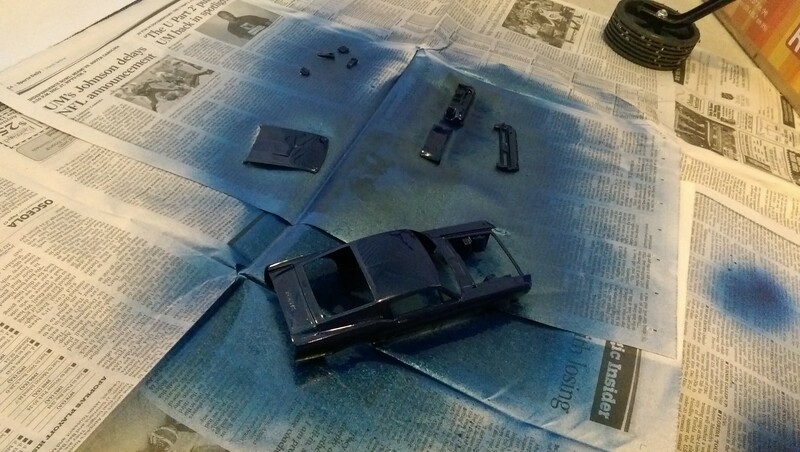 I started by spray painting the pieces using Testors One Coat Lacquer Spay — Metallic Blue. This was beneficial as I shouldn’t have to worry about a primer coat. (In the future, I will probably move away from the one coat spray’s). As I’m sure you can imagine, it’s also less precise painting with a spray can (as opposed to a spray gun). This part wasn’t as difficult as I initially expected — with a little patience. The directions were straight forward and available in multiple languages. So long as you can read, this is probably the least stressful of the whole project. That said, the assembly directions would have been more beneficial if the some of the sequences were changed around. However, I feel that more experienced modelers would have sniffed this out and adjusted accordingly. Oh, you’ll noticed the engine block in the image below. 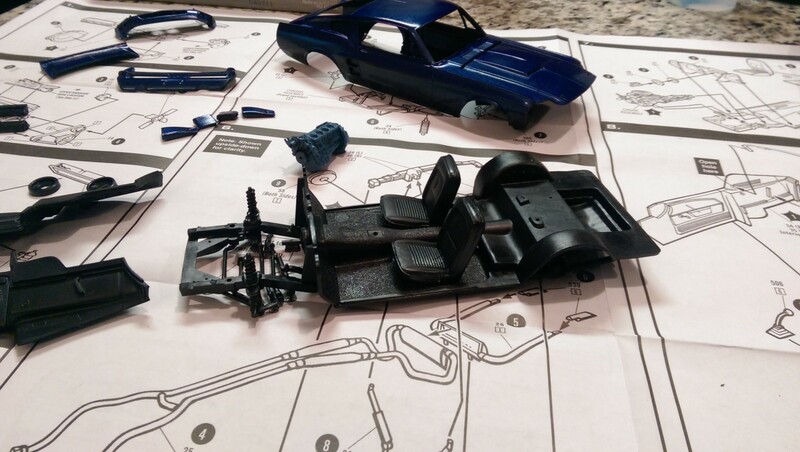 I painted about 5–6 pieces individually before full assembly. When trying to apply plastic glue, it would just eat the paint away. 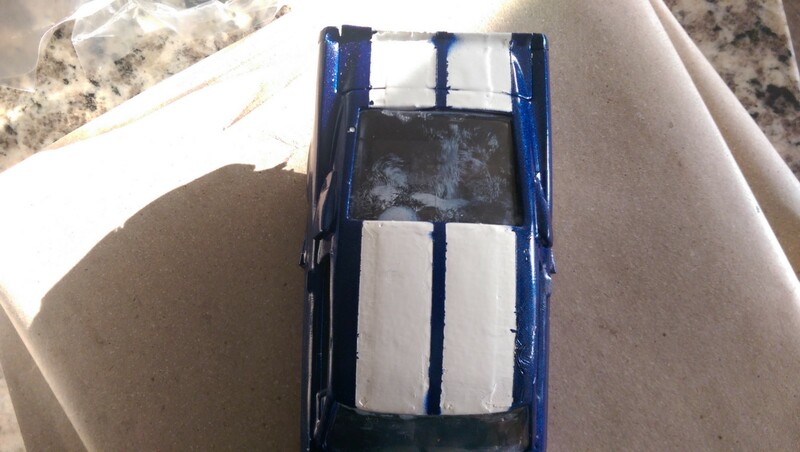 So I dipped the engine block in plastic glue to try to kill all the paint. Didn’t work as expected. This is probably the dumbest thing I’ve done. Lesson learned. 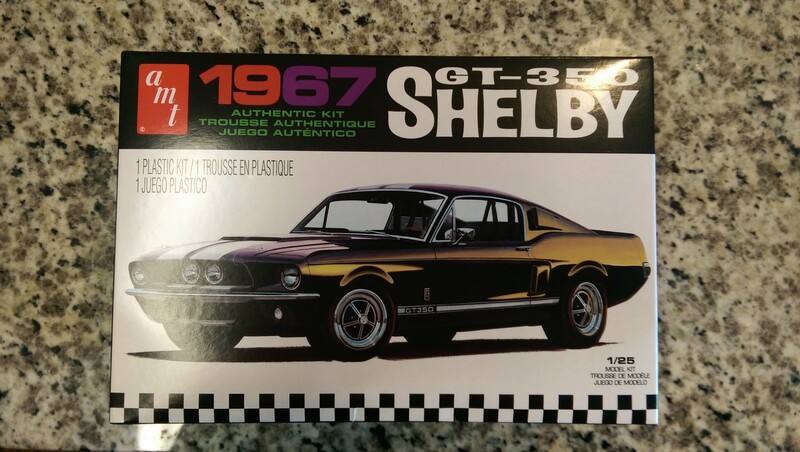 I’m unsure whether it’s entirely visible here but, when spray painting — the lacquer is so thick, that it actually nuked the Shelby logo from the grill. I’ve asked for some help in my RPF post and received some great suggestions. 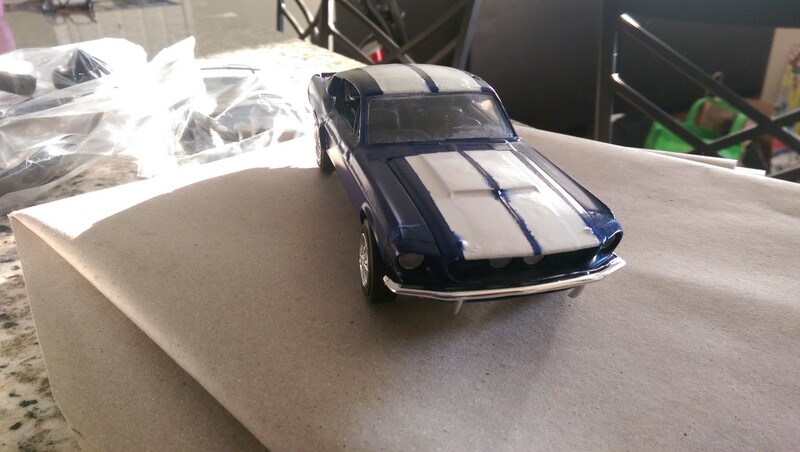 It’s also not entirely visible in this shot but, I also messed up the front windshield. 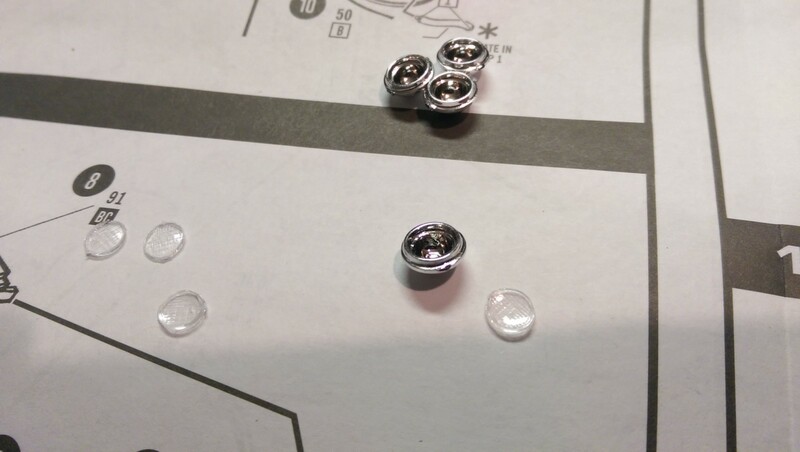 The plastic glue isn’t really the best for holding those pieces together so I opted for super glue (not a good idea). The error of my ways will be on full display in later shots. Oh, and those accent pieces I mentioned earlier. Check them out (below) near the door and rear windshield. You’ll notice the top one matches a bit better (paint/color wise) than the bottom one. 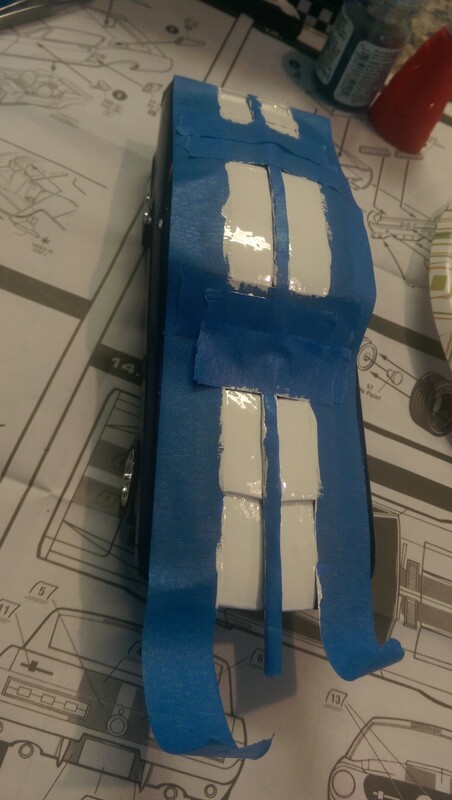 When painting the car, I didn’t cover the bottom half nearly as thorough as the top. This is made more apparent after gluing on the accent piece. In the future, I’ll be sure to glue those on first, then paint it all together for more consistency. Overall, at this point, I’m still feeling confident — a few minor errors but, I think this is very much so a salvageable project (especially with it being my first). I mean, the shot above doesn’t look like a horrible piece of work thusfar right? 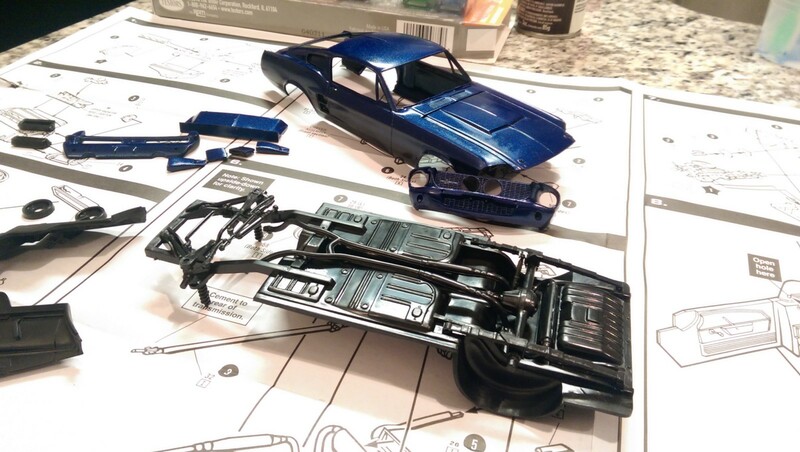 So I just need to assemble the front grill and rear bumper. The front grill consists of headlights (man, I love those big headlights). The plastic glue wasn’t cutting it, so I switched to good ole’ super glue. 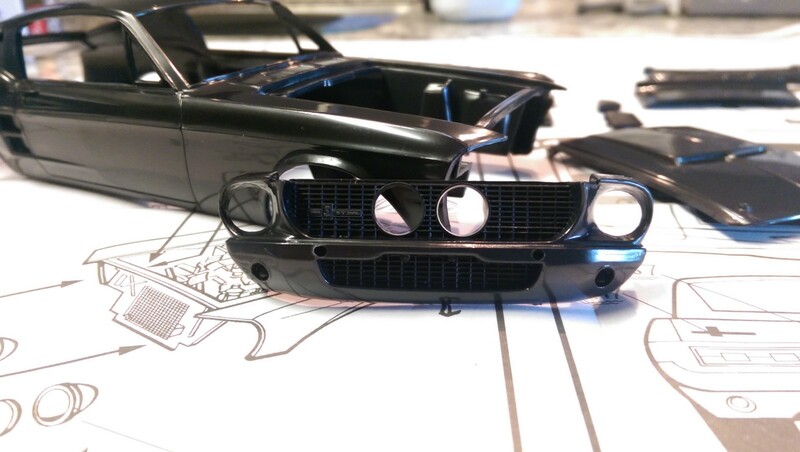 Much like the spray paint on the front grill, the super glue killed some of the detail (grid) of the headlights. It’s very difficult to get the clear plastic front to sit perfectly in the bowl shaped container. Yup, totally forgot about these. I should have done this at the painting stage. Note to self, don’t ever use masking tape. Ever. Anyway, here is the final project. When attempting to reunite the rear windshield, I guess some paint/super glue was on my finger and got applied to the window. To this day, I have no idea how to get it off. Windex does not work. You’ll also note that my masking tape, didn’t quite provide the affect I was looking for. Paint was still able to bleed outside of the markings. Originally published at seanwragg.com on December 14, 2014. Writing about code, comics, and fhqwhgads!